<b>** TO VIEW THE MEANINGS AND USES OF THE DROPS, VISIT OUR BLOG - <a href="http://drreckeweg.wordpress.com/"><b>CLICK HERE.</b></a></b><br> <br> <b>Dr Reckeweg Bio 87 (Formerly R87)</b><br> <br> <b>** PLEASE NOTE: **</b> All the Dr Reckeweg drops numbered from <b>82-93</b> are manufactured in Dr Reckeweg's Spanish Laboratories <b>(Tegor Laboratories)</b>. They are sold and marketed under the Tegor brand name and are the same original products as before, just different packaging.. <br> <br> <b>Dr. Reckeweg</b> is a family-owned business whose origins can be traced back to the turn of the last century. 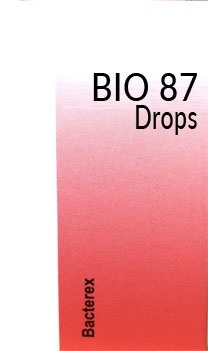 Their drops are produced from raw materials of the highest quality and are strictly manufactured in accordance with the German Homeopathic Pharmacopoeia, the European Pharmacopoeia and comply with international production standards.<br> <br> <b>INGREDIENTS</b><br> Botulinum X12, X30, E-Coli X12, X30, Glandulae thymi X6, Hydrastis canadensis X3, Pneumococcinum X12, X30, Proteus X12, X30, Pseudomonas X12, X30, Salmonella X12, X30, Scarlatinum X12, X30, Staphylococcinum D12, D30, Streptococcinum X12, X30, Tuberculinum X12, X30,Ethanol, Aqua purificata. ** PLEASE NOTE: ** All the Dr Reckeweg drops numbered from 82-93 are manufactured in Dr Reckeweg's Spanish Laboratories (Tegor Laboratories). They are sold and marketed under the Tegor brand name and are the same original products as before, just different packaging..
Botulinum X12, X30, E-Coli X12, X30, Glandulae thymi X6, Hydrastis canadensis X3, Pneumococcinum X12, X30, Proteus X12, X30, Pseudomonas X12, X30, Salmonella X12, X30, Scarlatinum X12, X30, Staphylococcinum D12, D30, Streptococcinum X12, X30, Tuberculinum X12, X30,Ethanol, Aqua purificata.